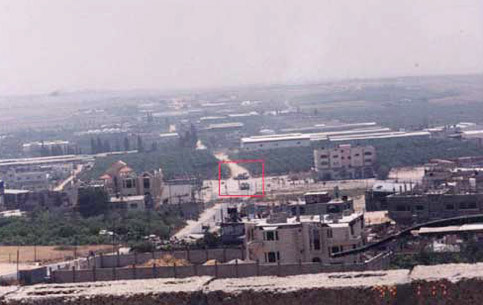 Israeli tanks controlling Bait Lahia junction on Salah al-din Street during the offensive on Beit Hanoun in May-June 2003. A preliminary assessment of the effects of the Israeli operation “Forward Shield,” in the northern Gaza Strip, particularly in Beit Hanoun, shows that Beit Hanoun and neighbouring areas suffered considerable damage. This report covers the period 29 June to 5 August 2004. Aside from the deaths and injuries (detailed later in this report), damage and destruction to property and infrastructure are primary humanitarian concerns resulting from the operation. Public and private property - homes, agricultural land, factories, educational facilities, roads, electricity, and water and sewerage networks - were damaged or destroyed in Beit Hanoun. For example, at least 17% of total arable land in Beit Hanoun was levelled. Homes, industrial facilities and agricultural land were also reported damaged or destroyed in Beit Lahia and Jabalia. The Israeli Defense Forces (IDF) deployed around Beit Hanoun in the northern Gaza Strip on 29 June, following the deaths of two Israelis in a rocket attack on the Israeli town of Sderot. Rocket attacks have continued intermittently during and after the period of the IDF deployment. Beit Hanoun and areas immediately bordering Beit Hanoun to the southeast and southwest were the main focus of operation “Forward Shield”. The IDF expanded further west on 3 August moving tanks and other armoured vehicles to positions on high ground northeast of Jabalia camp and in eastern Beit Lahia. IDF redeployment from northern Gaza began at 1am on 5 August. Palestinian security positions were re-manned early the same day and have remained there since. Since the redeployment, IDF bulldozers and tanks continue to operate in the northeast of the Gaza Strip up to approximately one kilometre west of the border with Israel. At two locations, (Abu Safia in northeastern Jabalia, approximately one kilometre from the border and As Shurrab in northeastern Beit Hanoun approximately 800m from the border) tanks and bulldozers are establishing large raised sand platforms, generally the foundation for IDF observation posts. IDF operations are ongoing and access remains limited in some areas. Therefore, an exact assessment of the humanitarian impact of operation “Forward Shield” remains problematic. Figures included in this report are from various sources. Figures are those available to date that OCHA considers most accurately reflect the situation observed. Ministry of Health sources report that in the period 29 June to 5 August 2004, 19 Palestinians were killed and 154 were injured. Three IDF soldiers were reported injured during the same period. Beit Hanoun and surrounding areas form one of the main agricultural areas in the Gaza Strip, producing mainly citrus fruits and olives. Levelling of agricultural land by IDF bulldozers and tanks was one of the main components of operation “Forward Shield.” It will affect the availability of food and ability of residents to support themselves at a time when the cost of food in the area is rising. Initial assessments indicate that approximately 2,891 dunums (289.1 hectares) of land in Beit Hanoun, Beit Lahia and Jabalia, were levelled during the IDF operation. Beit Hanoun: According to the Beit Hanoun Muncipality, the total area of Beit Hanoun is 18,000 dunums (1,800 hectares), of which 11,440 dunums (1,140 hectares) is registered agricultural land. More than 17% or 2,038 dunums (203.8 hectares) of agricultural land was levelled, according to the Al Mezan Centre for Human Rights. The orchard area between Salah Ad Din Street and As Sika Street has been almost completely cleared of trees. Eastern areas of Beit Hanoun, including An Nazzaza, Al Farrata, As Shurrab, Al Masriin were also affected. Jabalia: Al Mezan Centre for Human Rights reports that 706 dunums (70.6 hectares) of agricultural land located within the northeastern boundary of Jabalia municipal area was also levelled. Beit Lahia: Al Mezan Centre also reports that 147.5 dunums (14.7 hectares) of agricultural land was levelled in Beit Lahia municipal area. In addition, the centre reports that six livestock farms, including poultry pens and cattle sheds, were damaged or destroyed during IDF operations. Private Property: UNRWA reports that 24 families (145 people) are now homeless in Beit Hanoun, a result of 17 residential buildings being destroyed during IDF operations. Another 84 families (584 people) residing in 76 residential buildings had their properties damaged. The destroyed and damaged shelters were mainly located on Salah Ad Din Street, As Sika Street and Khalil Al Wazir Street in western Beit Hanoun and in Al Wazir Street, Al Farrata road and Fayez Hamad Street in eastern Beit Hanoun. Two houses were destroyed and three were damaged in Beit Lahia and two houses were destroyed and eight were damaged in Jabalia, according to an assessment by Al Mezan Centre for Human Rights. At least three dozen houses and buildings in and around Beit Hanoun were occupied by IDF soldiers for varying periods during operation “Forward Shield” many of which were damaged. In one example, a three-storey family home on As Sika Street was taken over by IDF soldiers for five days. Commercial Property: At least 22 industrial facilities were reported destroyed or damaged during operation “Forward Shield.” This will have an impact on employment and livelihoods. The Beit Hanoun Muncipality reports that eight factories, including a tile factory, a paving stone factory and a cement block factory, were totally destroyed during the IDF operations. All of these factories were located between As Sika Street and Salah Din Street. The Beit Hanoun Muncipality also reports that a further nine industrial facilities were damaged. In addition, four industrial facilities and workshops were destroyed in Jabalia and one workshop was destroyed in Beit Lahia, according to the Al Mezan Centre for Human Rights. - Beit Hanoun Agricultural School: damage to the boundary wall – Khalil Al Wazir Street. Frequent breaks in the water, power and sewerage networks, and damage to roads and other infrastructure resulted from movement of IDF heavy armoured vehicles. Further damage resulted from establishment of IDF positions, embedding tanks, construction of earth mounds and digging of trenches. Roads: Damage to main and branch roads (both asphalt and non-asphalt roads) is estimated to be at least $2 million, according to a compilation of sources. A more comprehensive assessment of the road network is likely to show that damage is far more extensive. Khalil Al Wazir Street (asphalt), the main north-south road in Beit Hanoun; As Sika Street (asphalt), running north-south in western Beit Hanoun; As Sika Bridge (asphalt), located at the southern end of As Sika Street, just north of the junction with Salah Ad Din Street, also damaged twice during IDF operations in 2003; Salah El Din Street (asphalt), damaged at several points: Beit Lahia/Jabalia junction, Al Wahd road junction, and the junction with the Beit Lahia bypass road; Al Wahd road (non-asphalt), running across Salah Ad Din and As Sika Street; Sultan Abdel Hamid road (asphalt), between As Sika and Salah Ad Din streets; Basel Na’eem Street (asphalt), running east from Khalil Al Wazir Street; Fayez Hamad Street (asphalt), running east from Khalil Al Wazir Street; Al Bashaa road (asphalt), running east from Khalil Al Wazir Street. Damage to newly constructed asphalt roads also included breaks in the storm drain system. Several dirt roads leading from central Beit Hanoun to eastern areas (al Farrata, Al Masriin, An Nazzaza) also sustained damage resulting for similar reasons. Water: Water networks sustained significant damage from digging trenches, embedding tanks, and by regular movement of IDF heavy armoured vehicles. The Beit Hanoun Municipality reported damage to main lines, pipes and manholes. International Management Group (IMG estimates damage to be $250,000. During the operation repairs were difficult to carry out due to intensified military activity, despite assistance by the International Committee of Red Cross (ICRC) and OCHA. In addition (and not included in the $250,000 mentioned above), the Municipality stated that 17 privately-owned water wells were destroyed. They were located in eastern areas of Beit Hanoun and on As Sika Street and used for drinking water and/or agricultural use. Sewerage: The municipal sewerage network was similarly damaged by IDF-established trenches and by regular movement of IDF armoured vehicles. According to IMG, damage is estimated at $150,000. Municipal sources reported damage to septic tanks, main underground sewerage pipes, house connections, and man holes. Electricity: Electrical networks throughout Beit Hanoun sustained substantial damage, estimated at $150,000 by the IMG. During IDF operations, some temporary repairs were conducted by municipal engineering teams, following coordination with the IDF and facilitated by the ICRC and OCHA. Initial assessments indicate damage was sustained to the low and high voltage nets, including overhead and underground cables, columns and wood posts. Solid Waste: A significant volume of solid waste (rubble from destroyed properties/infrastructure) resulted from IDF operations inside Beit Hanoun. In particular, Beit Hanoun valley, a small depression which runs between the Beit Hanoun Industrial Zone and under the bridge across the southern section of Khalil Wazir Street, was filled with solid waste by IDF bulldozers - and will need to be cleared. The Municipality has also reported a need for 100 garbage containers, as replacements for containers destroyed during IDF operations. For the facilitation of humanitarian assistance and accurate reporting, other international organisations need unrestricted access to the areas. Entry into Beit Hanoun during the operation was coordinated with the IDF. However, serious concerns remain about the safety and security of humanitarian staff following several incidents in which shooting continued near their work. It is clear that humanitarian assistance will be affected if better communication arrangements cannot be addressed by the IDF. Damage to agricultural land and other property has continued since 5 August. Reports continue to be received of land levelling, destruction of water wells, and damage to other property resulting from the ongoing IDF activity in areas in eastern Beit Hanoun and eastern Jabalia, including the consolidation of IDF positions in Abu Safia (north-eastern Jabalia) and As Shurrab (eastern Beit Hanoun). Access to these areas for verification is currently restricted. Israeli occupying forces have continued their offensive on the northern Gaza Strip town of Beit Hanoun and neighboring areas since 28 June 2004. Since then, a number of Palestinians, mostly civilians, have been killed, large areas of Palestinian agricultural land have been razed and the civilian infrastructure of the town has been largely destroyed. Israeli troops have also isolated the town from the rest of the Gaza Strip. · Streets were empty as Israeli troops had seized a number of houses in the town and transformed them into military posts, from which they fired at passing Palestinian civilians. · There was an economic crisis due to shortages of some foodstuffs and fuels, as trucks loaded with food had not been allowed to enter the town without prior coordination with Israeli troops. Some foodstuffs were brought into the town using animal carts, which had been under the threat from Israeli gunfire. · Large destruction, especially to the civilian infrastructure, was apparent. · Green areas disappeared from the town as Israeli troops had razed large areas of agricultural land. At approximately 02:00 on Thursday, 29 July 2004, Israeli troops, reinforced by heavy military vehicles, moved nearly 2000 meters into the east of Jabalya near Beit Haoun. They destroyed a fence and 2 rooms belonging to a concrete factory and arrested its guard, 'Abdul Hamid 'Abdul 'Aziz Abu Khousa, 55. At approximately 07:00 on the same day, Israeli troops further tightened the siege imposed on the town. They closed the road leading to the town from the northwest, which had been the only road available for the movement of Palestinian civilians out of the town on foot. Palestinian civilians were forced to use branch roads, but Israeli troops fired at them and forced them to go back to the town. At approximately 01:00 on Sunday, 1 August 2004, Israeli troops, reinforced by heavy military vehicles and helicopters, moved into 'Abed Rabbu farm in the east of Jabalya. Under the cover of intense gunfire, Israeli troops moved forward and took position on al-Kashef hill, nearly 500 meters to the east of Jabalya refugee camp. They razed areas of agricultural land belonging to the families of al-Haj and 'Abed Rabbu. 2. Sami Fadel al-Basiouni, 19, wounded by a live bullet in the right foot. At approximately 18:00 on the same day, Israeli troops placed barbwire around 46 donums of agricultural land that had been already razed by those troops. These areas of land, located near Erez crossing to the northwest of Beit Hanoun, belong to the families of Swailem, Hammad and al-Za'anin. At approximately 21:00 on Monday, 2 August 2004, Israeli troops positioned on Qulaibu hill to the east of Sheikh Zayed town in Beit Lahia opened fire at Palestinian houses in Tal al-Za'tar neighborhood and neighboring areas. A Palestinian woman, Nasra Mohammed Abu Hashish, 33, was wounded by 2 live bullets in the right foot and arm, and her child, Hana, 2, was injured by shrapnel in the right thigh, while the two were inside their house. At approximately 01:30 on Tuesday, 3 August 2004, more Israeli heavy military vehicles were brought to Qulaibu hill, east of Beit Lahia, under the cover of intense shelling. At approximately 12:30 on the same day, Israeli troops positioned in al-Sikka Street in the west of Beit Hanoun fired at a number of Palestinian civilians who attempted to get out of the town. A woman, Samar Nashwan, 22, was wounded by a live bullet in the right thigh. At approximately 15:30 on the same day, Israeli troops positioned in the northwest of Beit Hanoun opened fire at a number of Palestinian civilians who tried to enter the town. A child, Mohammed Yousef Nasser, 10, was seriously wounded by a live bullet in the left thigh. Also at approximately 15:30 on the same day, Israeli troops positioned on Qulaibu hill forced residents of a 2-storey house belonging to Ramadan Yousef Ahmed 'Ali to leave their house. Then, they demolished it and surrounded the area with sand barriers. Israeli troops had transformed the house into a military site 3 days earlier. At approximately 02:00 on Wednesday, 4 August 2004, Israeli troops shelled Palestinian houses in the east of Jabalya and Tal al-Za'tar neighborhood. The shelling continued sporadically for several hours. Six Palestinian civilians were injured when they were inside their houses; one of whom was in a serious condition. At approximately 14:30 on the same day, Israeli troops opened fire at Palestinian houses in Zimmu Street in the east of Beit Hanoun. A Palestinian woman, Hanan Sa'id Hamad, 26, was injured by shrapnel throughout the body, and two of her children were also injured: Miriam, 5; and Nadi, 6, injured by shrapnel in the feet. The mother and her children were inside their house when they were injured. 3. 'Ali 'Abdul Hamid Abu 'Olba, 10, hit by a live bullet to the abdomen. 2. Ibrahim 'Anan al-Barrawi, 9, hit by a live bullet to the chest. Most of the casualties were in the upper part of the body. Electricity was cut off from the whole northern Gaza Strip. At approximately 03:00 on Thursday, 22 July 2004, Israeli troops destroyed a brick 500-square-meter factory and a razed a 6-donum area of agricultural land owned by Isma'il Ibrahim Abu 'Eida in the east of Jabalya, nearly 1000 meters to the west of the border between the Gaza Strip and Israel. At approximately 12:00 on the same day, Israeli troops positioned atop of Wasfi al-Za'anin's house in al-Sikka Street in the west of Beit Hanoun fired at Tariq Qasfi Nasser, 20, who was walking in the street, wounding him with a live bullet in the right foot. At approximately 17:00 on the same day, Israeli troops started to raze more areas of agricultural land near al-Sikka Street. They also raided the building of the agricultural cooperative society and destroyed its fence. On Saturday evening, 24 July 2004, Israeli troops shot dead a Palestinian child who was on the roof of his house. According to the victim's cousin, Jalal Nasser, 24, who was with him, at approximately 22:30, Hussam Helmi Mahmoud Nasser, 16, was going back home, nearly 200 meters to the east of al-Sikka Street, after he had bought food. Hussam and Jalal went up to the roof of the 3-storey house. A few minutes later, a live bullet was fired at Hussam from a house that had been seized by Israeli troops. The bullet hit Hussam in the chest. The cousin rushed down and informed the family of what happened. Immediately, Hussam was evacuated to a clinic, but he soon died from his wound. On Saturday morning, 25 July 2004, Israeli troops expanded their offensive on Beit Hanoun. They moved into al-Amal neighborhood in the east of the town. They raided a number of houses and transformed their roofs into military sites. They also razed approximately 300 donums of agricultural land belonging to the families of al-Shawa, Shurrab and Abu 'Ouda. At approximately 07:30 on the same day, Israeli troops were positioned near the crossroads of al-Masriyeen Street and Khalil al-Wazir Street in the center of the town. They opened fire at neighboring areas. A Palestinian civilian, 'Abdul Salam Abu 'Ouda, 27, was wounded by a live bullet in the chest. Israeli troops prevented ambulances from reaching him, so a local doctor performed a surgery for him in the town's clinic. At approximately 04:00 on Tuesday, 27 July 2004, 8 Israeli military vehicles, including 2 bulldozers, moved into the north of Beit Hanoun. They raided a school in the area, demolished its fence and severely damaged its classrooms. Israeli troops also razed more areas of agricultural land belonging to the families of al-Shawa and Nasser. At approximately 10:30 on Wednesday, 28 July 2004, Israeli troops surrounded Jalal Nashwan's house at al-Sikka Street in the southwest of Beit Hanoun, and demolished its fence. 3. Samir Khalil al-Nemnem, 40, a taxi driver from Jabalya refugee camp, wounded by a live bullet in the left thigh. At approximately 19:30 on the same day, Israeli troops partially demolished a 150-square-meter, 2-storey house owned by 'Abdul Karim Fawazi Abu Jarad, in which 20 people (3 families) lived, at al-Sikka Street. Israeli troops had forced the families out of the house 10 days earlier and used it as a military site. Israeli occupying forces have continued to impose a tight siege on Beit Hanoun. Since the beginning of the Israeli offensive on the town, at least 3500 donums of Palestinian agricultural land, mostly planted with citrus which is the main agricultural product of the Gaza Strip, have been razed. Israeli occupying forces have continued their offensive on the northern Gaza Strip town of Beit Hanoun since 28 June 2004. Since then, a number of Palestinians, mostly civilians, have been killed, hundreds of donums  of Palestinian agricultural land have been razed and the civilian infrastructure of the town has been largely destroyed. Israeli troops have also isolated the town from the rest of the Gaza Strip. At approximately 12:30 on Friday, 16 July 2004, Israeli troops started to demolish a number of civilian facilities in the southwest of Beit Hanoun. By 18:00, they had demolished 3 brick factories owned by Ahmed Hassan Musleh, Jaber 'Abdu Daifallah and Mahmoud Hassan Musleh. They had also demolished a desalination facility owned by Habeeb al-Basiouni, a tin-made house owned by 'Eid al-Sawarka, and fences of 6 houses belonging to al-Basiouni family. At approximately 14:00 on the same day, Israeli troops razed large areas of Palestinian agricultural land planted with citrus near al-Shawa fuel station to the west of Salah al-Din Street in the west of Beit Hanoun. At approximately 15:30 on the same day, Israeli troops started to raze large areas of Palestinian agricultural land in the east of Jabalya. By 19:00, they had razed nearly 50 donums of agricultural land belonging to the al-Jadba. At approximately 02:00 on Saturday, 17 July 2004, Israeli troops shelled Palestinian houses in al-Masryeen area. Shrapnel from artillery shells hit Jamil Rabah al-Masri's house, and injured his child, Kholoud, 7, who was sleeping, in her right shoulder. At approximately 15:30 on Sunday, 18 July 2004, Israeli troop razed large areas of agricultural land planted with citrus and vegetables belonging to the families of al-Shanti and Qassem at al-Sultan Street in the west of Beit Hanoun. They also destroyed fences of a number of houses and 2 civilian cars. In the meantime, Israeli troops continued to raze areas of agricultural land in the east of the town. At approximately 08:00 on Monday, 19 July 2004, Israeli troops razed more areas of agricultural land in al-Basha area in the east of Beit Hanoun. They also started to establish a military post in the area. Israeli troops blocked a muddy road leading to the area. At approximately 05:00 on Monday, 19 July 2004, 10 Israeli military vehicles moved into al-Na'aima Street. They surrounded a 180-square-meter, 2-storey house belonging to Nahed 'Abdul Rahman Abu 'Ouda, who was killed by Israeli troops near his house last week. Israeli troops surrounded the house and neighboring houses. At approximately 07:00, Israeli troops demolished Abu 'Ouda's house and his brother's house. Four neighboring houses belonging to the Abu 'Ouda family and store owned by Fayez Jadallah al-Kafarna were severely damaged. At approximately 23:30, on the same day, Israeli military vehicles moved from Erez crossing towards the east of Beit Lahia. They started to establish a road between the area and Salah al-Din Street in the east, by razing large areas of agricultural land planted with citrus owned belonging to the families of Abu Jarad and 'Abdul Dayem. At approximately 12:30 on Tuesday, 20 July 2004, a number of Israeli military vehicles moved towards the southern entrance of Beit Hanoun. They surrounded the municipality of the town and held its staff inside for 2 hours. At approximately 15:30 on the same day, Israeli troops destroyed 2 sites of the Palestinian National Security Force in the south of Beit Hanoun. At approximately 17:30 on the same day, Israeli troops started to destroy a number of civilian facilities in the west of Beit Hanoun. By 20:30, they had destroyed a 1-donum agricultural nursery, a vegetable fridge, an electricity generator, a bird farm, agricultural equipments and a well. At approximately 18:00 on Wednesday, 21 July 2004, Israeli troops destroyed al-Sikka Street in the west of Beit Hanoun. They destroyed the water and sewage networks of the area. They also destroyed a well owned by Mohammed Mousa Shabat; a deserted house owned by Tayseer al-Hwaihi; fences of 2 houses; and a shop. This week, PCHR received appeals from Palestinian civilians living in Beit Hanoun, complaining about a shortage of foodstuffs. Israeli troops established a muddy road, nearly 1 kilometer away from the town to allow Palestinian civilians to move on feet. Electricity and water supplies have been cut from several parts of the town. Israeli occupying forces have continued their offensive on the northern Gaza Strip town of Beit Hanoun since 28 June 2004. Since then, 14 Palestinians, mostly civilians, including 3 children, have been killed by Israeli troops. Seven of the victims were killed this week. Israeli troops have also razed hundreds of donums of Palestinian agricultural land and the largely destroyed the civilian infrastructure of the town, isolating it from the rest of the Gaza Strip. On Thursday morning, 8 July 2004, Israeli occupying forces, continuing a wide scale offensive on the northern Gaza Strip town of Beit Hanoun which started on the 28 June 2004, killed 7 Palestinians, including a woman. According to preliminary investigations by PCHR, at approximately 01:30, an infantry unit of Israeli occupying forces moved into al-Na'aima Street in the east of Beit Hanoun, towards a house belonging to the family of Nahed 'Abdul Rahman Abu 'Ouda, 44, who is wanted by Israeli troops. PCHR learned that Abu 'Ouda was killed in an exchange of fire with Israeli troops, but those troops have continued to hold his body in a Palestinian ambulance, without allowing the ambulance to travel out of the town. 3. Na'im Mubah al-Kafarna, 41. The fourth member was able to escape. A Palestinian civilian, Yousef Ahmed Mousa al-Za'nin, 52, tried to help the victims, but Israeli troops immediately shot him dead. At approximately 06:00, a number of members of the Palestinian resistance clashed with Israeli troops. One member of the resistance, Hamed Ahmed 'Abdul 'Aziz Abu 'Ouda, 27, was killed in these clashes. As a result of the intense shelling to Palestinian residential areas in the town, a Palestinian woman, Jamila 'Abdul Hadi Hamad, 44, was killed by several live bullets throughout the body, when she was near her house. Her child, Wafaa', 13, was also seriously wounded by a live bullet in the chest. In addition, 5 other civilians were wounded. Israeli troops have continued to hold 3 Palestinian ambulances. The ambulances were trying to convey the body of a Palestinian killed by the IOF, a woman in labor and an injured civilian to hospital. They have also continued to raze areas of Palestinian agricultural land in Beit Hanoun and in the neighboring Jabalya town. They have razed at least 1400 donums of agricultural land so far. PCHR remains extremely concerned that Israeli troops will continue with these attacks against Palestinian civilians and their properties in Beit Hanoun. Israeli troops further tightened the siege imposed on the town, and did not allow entry of the bodies of these victims into the town until 10:30 on Friday, 9 July 2004. On Friday afternoon, Israeli troops fired at a number of Palestinian civilians, mostly children, at the southern entrance of the town. Three civilians, including 2 children, were injured, one of whom was in a serious condition. On the same day, Israeli troops arrested Mahdi Mohammed al-Basiouni, 24. At approximately 01:00 on Saturday, 10 July 2004, Israeli troops, reinforced by helicopters, moved into Tallat Qulaibu area in the west of Beit Lahia. They razed dozens of donums of agricultural land planted with citrus fruits. At approximately 06:00 on the same day, Israeli troops fired an artillery shell at a number of Palestinian civilians who were collecting wood in the east of Jabalya. One civilian, Mohammed Nafez Abu Jabal, 24, was seriously injured by shrapnel throughout the body. He lost one of his legs. At approximately 10:30 on the same day, Israeli troops fired at a number of Palestinian women in al-Wad Street when they tried to exit the town. One woman, Latifa 'Eid Abu 'Amsha, 26, was wounded by a live bullet in the right thigh. On Friday, crews of the ICRC faced extreme difficulties in delivering foodstuffs and water to houses in the town. At approximately 19:00 on Sunday, 11 July 2004, Israeli troops fired at Mahmoud Mohammed 'Obaid, 38, in the east of Jabalya. He was wounded by a live bullet in the right shoulder. Israeli troops also destroyed a factory in the west of Beit Hanoun. At approximately 03:00 on Monday, 12 July 2004, Israeli troops demolished a 200-square-meter, asbestos-roofed house owned by Ahmed Hassan Hussein Abu Kalloub. At approximately 08:30 on the same day, Israeli troops reopened the road located to the northwest of Beit Hanoun for one hour only. At approximately 14:00 on the same day, Israeli troops destroyed a factory of concrete in the south of the town. They also razed more areas of agricultural land in the east and west of the town. At approximately 19:00 on Tuesday, 13 July 2004, Israeli troops raided and searched a number of houses in the northwest of Beit Hanoun. They arrested Jamal Mohammed Swailem, 44. At approximately 14:30 on Wednesday, 14 July 2004, Israeli troops surrounded 5 houses belonging to the Swailem family in the northwest of Beit Hanoun. They forced residents of the houses out and searched the houses. Israeli troops left the area at approximately 18:00. On Wednesday morning the IOF continued shelling the town. By the evening they had injured at least 50 civlians, 3 of whom were in a serious condition. At approximately 13.30 on Wednesday a group of civilians, mostly children, had gathered at Hammouda petrol (gas) station and were throwing stones at the IOF. IOF opened fire on them. ‘Atiya Mohammed Muhsen al-‘Ajrami, 19, from Jabalya, was killed by a live bullet in the neck. At approximately 20.30 the IOF extended their incursion further into the town.. the offensive continues and civilians are still being deprived of food, water, electricity and other basic services. A large scale offensive was initiated on the northern Gaza Strip town of Beit Hanoun. Since then 2 Palestinians have been killed and 50 others injured, mostly children. The Israeli defence minister Shaul Mofaz stated that they would remain in the town for as long as deemed necessary. According to preliminary investigations carried out by PCHR the incursion began at about 0400 on the 29th. IOF, reinforced by helicopters moved nearly 2 km into the town. A few hours later at least 20 military vehicles moved towards Slah al-Din street, the main road between the town and neighbouring communities. They destroyed the road and closed it. A number of Israeli military vehicles were positioned at the entrance to the town and opened fire at a number of Palestinian children who threw stones at the troops. 10 children were injured. That evening a number of Israeli military vehicles, accompanied by 3 bulldozers, moved from southbound from Erez. They destroyed all branch roads leading to Beit Hanoun and all the electricity, sewage and water networks. A number of factories located to the north of the town were seized and turned into military posts. Large areas of agricultural land were razed and civilian facilities destroyed.